It’s a day to expect the unexpected. The Sun squares erratic Uranus and with that surprises may be in store. Be fluid and flexible to reduce potential stress and more readily coast through the twists and turns. Consider approaching the day proactively. Examine how you can connect more deeply to your individual needs. Stake your claim as your authentic self rather than whom you think you should be. 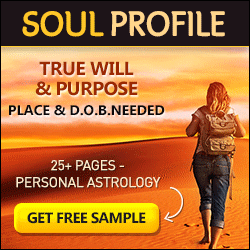 As assertive Mars moves into individualistic Aquarius, you’ve got celestial help on your side to pursue a new path. The Moon moves into Gemini, encouraging a desire to be inquisitive. Use this curiosity to your advantage. The Sun is at 4 degrees Capricorn, the Moon is in Gemini, Mercury is in Sagittarius, Venus is in Sagittarius and Mars is in Capricorn. With this combination of planetary energies try to: Discuss the latest book you’ve read with a sharp literary friend. Try not to: Forget to let others get a word in edgewise. Share the air. Sun Square Uranus: Impatient and Abrupt. And finally happy birthday to Annie Lennox, Helena Christensen and Sissy Spacek.